With the help of such international stars as Freddie Prinze, Jr. (I Know What You Did Last Summer), Matthew Lillard (Scream), and Saffron Burrows (Circle of Friends), the hit film WING COMMANDER has brought the five-million-copy bestselling series of games to big-screen life. Now the official authorized Confederation Handbook adds stunning background and authentic detail to the most powerful and popular CD-ROM game series of all time. 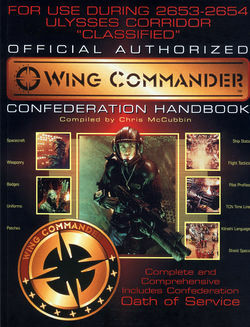 Lavishly illustrated with drawings, diagrams, and full-color photographs, the Wing Commander Confederation Handbook gives you the ultimate insider's understanding of the technical expertise, military precision, and awesome courage demanded of the thin red line of heroes that stands between Earth and annihilation.